What are shin splints? One thing for sure, it’s very annoying and you want avoid it at all cost! Shin splints cause a sore pain, which restricts you in practicing your sport and daily movements. The bright side of this injury is that it is treatable. Unfortunately. preventing it, isn’t possible in all cases, because one is more apt than the other. It is possible to train it though. One of the causes of shin splints is for example, ‘weak calves’. You can make them stronger due to certain exercises. There are a lot of things you can do to make sure you’ll avoid getting this well known injury. I think most are familiar with this injury. In most cases, it is an irritation on the inside of the shin and / or the muscles attached to it. The most common cause of the shin splint is excessive physical effort. If your leg muscles aren’t strong enough to handle a certain amount of effort, the pressure on your shins will increase. When this pressure gets too much, small tears will appear. Although small tears in the bones are very normal, with shin splints the shins won’t have enough time to recovery and create new bone tissue. When you consistently put to much pressure on you shins, you can even suffer from a bone inflammation. Every injury comes with a cause. The advantage of this is that you can always ask yourself if you can do something to prevent it. Well you can, so let’s line them up! This means that you lean too much on the inside of your foot while running. What can you do about this? BUY PROPER RUNNING SHOES! It's an investment, but one that’s really worth it, I can tell you that. It is really important that you get enough support while running. Nowadays, you can do a walking test at most running shoe outlets, so that makes it easier to find the shoe that will fit you perfectly. It’s pretty obvious that when you never or barly train your calves and go for a big run, that your calves will fail and running injuries will ocurre. Let’s go though a couple of good exercises to increase your calve muscle strength. Stand upright flat on your feet, then go up so you’ll stand on your toes and go back to flat on your feet and then back to the toes again. Do this 15 times x 3 sets. Walk around on your toes for short distances. Stand on your toes then make quick small steps without your heels touching the ground. Do 20 small steps forward and walk back to the beginning in 20 steps. Repeat this 4 times. We all know lunches, right? An intense exercise which will make your buttocks burn, but it’s also great for your calves! This is how you do it, stand upright. 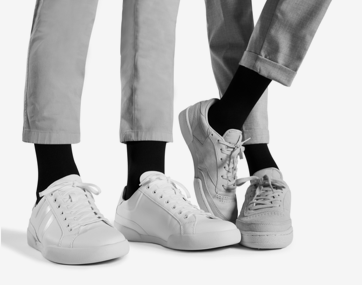 Step forward with one foot. The toes of both feet should be facing straight ahead. Be sure your legs are aligned - your front knee should be aligned with the foot. Lower your back knee towards the floor. Push back up to the starting position. Concentrate on squeezing your buttocks to push yourself up, and keep the abdominals tight and the lower back in a neutral position.Throughout the exercise, maintain the body in an upright position and avoid leaning forward. Do this 15 times x 3 sets. I know, I know! Maybe you don’t always feel like warming up and maybe you don’t really know how to do a correct warming up. However, shin splints usually go hand in hand with stiff and / or shortened calf muscles. You can test this by sitting in a squat position while keeping your feet flat on the ground. If your calf muscles feel too tight or even hurt, your calf muscles are shortened. You can improve this by stretching your calf muscles every day, both in the morning and evening. In addition, it is also smart to stretch the muscle behind your shin, the tibialis posterior. Do these different stretching exercises on daily basis and the chance of shin splints and other bad leg injury will be drastically reduced! Before you go for a run, you can do exercises like knee lifts, heels to buttocks and jumping jacks to warm-up your body. In addition, it is important to build your pace. I’ll say it more than often and I’ll keep saying it. Start off easily and don’t start with the speed of light like you’re the new Usain Bolt. So, start with a moderate pace and build your speed. In this way your end result will be significantly better, because you might even have the power to accelerate for the last part. Power you saved at the start of your run! Scientifically, it has not yet been proven, but the response of runners with shin splints complaints after wearing compression socks are incredible. The complaints reduce or even disappear! People who had to regret their raid to run through their complaints, now cheerfully announce that they are able to run again! What happens while you wear compression socks? 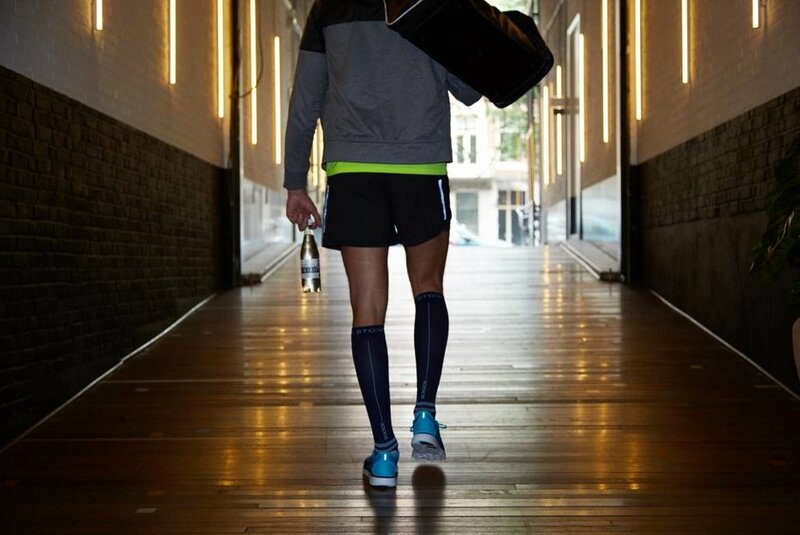 With compression socks, the calf muscles are tightly pressed against the shin, causing them to shake less during running. The STOX Running Socks go a step further than 'average' running socks. These special running socks make sure your leg muscles have optimal blood circulation while running. 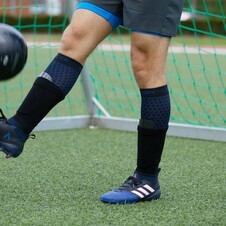 They also have a shock absorbing effect which drastically reduces muscle damage to the legs. Thanks to the compression, the leg muscles get enough oxygen and the body wastes and moistures are rapidly disposed. The socks give you the support you need and the design that matches your style. 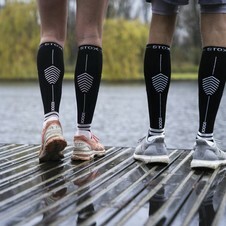 STOX Energy Socks - FIT TO RUN!